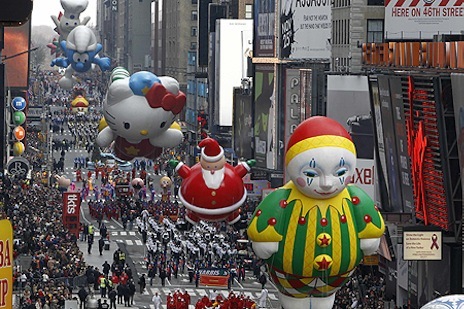 Macy's annual parade got the ratings ball rolling on Thanksgiving. The local newscast ratings wars have cooled down for a bit, even if the tempers at some stations haven't. But on to other matters, such as the Cowboys annual Thanksgiving Day home game. Dallas trounced the Oakland Raiders on CBS11 to the tune of 1,431,909 D-FW viewers. As usual, that wiped out all competing programming, but still couldn't outdraw the regular season unveiling of Jerry's Palace, when the Cowboys lost to the Giants on NBC's Sunday Night Football while 1,737,293 watched. That's still the record-setter so far among this year's 11 regular season games. The Cowboys' Turkey Day warmup act, Packers-Lions on Fox, drew a very nice-sized 624,340 viewers on Fox. And the morning hours were dominated by Macy's annual parade, which amassed 420,751 viewers on NBC and added another 142,512 for the CBS coverage. The Thanksgiving night ratings were paced by Texas' high-scoring win at Texas A&M, which averaged 536,117 viewers on ESPN. On Wednesday, the last day of the November sweeps, three of the four 10 p.m. local newscasts opted for a Holiday designation, which means they weren't counted as part of the overall averages. CBS11, the only station to count its late nighter, had the largest audience with 203,589 total viewers. But that was a bit lower than its overall ratings average, so the station would have been better off leaving it out of the mix. It was a tough call to make, given the anticipated "lead-in" advantage from CBS' CSI: NY, which delivered by easily winning its 9 to 10 p.m. time period. Moving on to a non-Cowboys Sunday, where the top ratings draw was Fox's Vikings-Bears game (563,263 viewers). NBC's Sunday night matchup -- Steelers-Ravens -- was runnerup with 481,827 viewers. HBO fared relatively poorly with its four-hour prime-time presentation of the Madison Square Garden concerts tied to the 25th anniversary of the Rock 'n' Roll Hall of Fame. The 7 to 11 p.m. extravaganza averaged just 20,305 viewers locally. The HBO movies bookending it -- The Rocker and The Day the Earth Stood Still -- both did better with 33,932 viewers apiece. Rock on.